Sonar technicians in the Navy play an important role in navigation at sea. Sonar techs aboard submarines are particularly crucial in helping detect obstacles and in plotting a safe course while deep underwater. Once closed to women, the sonar technician submarines or STS rating (which is what the Navy calls its jobs) is open to all sailors who meet the qualifying criteria. Sailors in the Sonar Technician, Submarine specialty (STS) operate submarine sonar, oceanographic equipment, and submarine auxiliary sonar and coordinate submarine sonar and underwater fire control. They conduct maintenance on all related submarine equipment. Sailors interested in this job go through a slightly different process than those in other ratings. 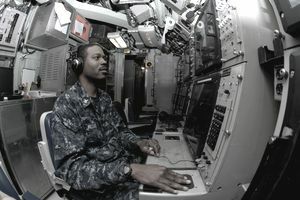 You enlist in the Navy's Submarine Electronics/Computer Field, then following Enlisted Basic Submarine School (BESS) and the first portion of the submarine learning center pipeline course, you are assigned to be trained as ET-COM, ET-NAV (both electronics technician jobs) FT (fire control technician) or STS. Your rating is determined by your preferences and the scores received in the above schools (as well as the needs of the Navy at the time you enlist). It should come as no surprise that duties in this rating are mostly performed aboard submarines. For the most part, this means an office environment, but some of the STS work, especially repairs, may require getting your hands dirty. First, you'll take the Armed Services Vocational Aptitude Battery (ASVAB) tests, which measure your fitness and capability for military jobs. For the STS rating, you'll need a combined score of 222 in the arithmetic reasoning (AR), math knowledge (MK), electronics information (EI) and general science (GS) segments of the ASVAB. Alternately, you can qualify with a combined score of 222 in the verbal expression (VE), AR, MK and mechanical comprehension (MC) segments. This rating requires a top secret security clearance from the Department of Defense, which requires an extensive background investigation. If you're planning to enlist in this rating, you can't have any history of drug abuse, and your record must be clear of any civil court convictions (other than minor traffic offenses). You also have to be a U.S. citizen, have normal color perception and normal hearing, and have to volunteer for submarine duty. So-called "moral turpitude" offenses will likely disqualify you from this rating. You'll spend four weeks in Basic Enlisted Submarine School, and 18 weeks in the Submarine Learning Center. Both of these are held at the Naval Submarine Base New London in Groton, Conn.
Training at the learning center includes apprenticeship technical training, tactical computer network operations and STS A-school. High performers may be selected for advanced training, or C-school before shipping out to the fleet.